The last time you'll have to buy pruners! It's one of the items in a gardener's tool belt that gets the most use, so investing in quality pruners really make a difference. This pair is tough as nails for years of gardening use... You can stop paying to replace cheap pruners with more cheap pruners! The design is clean; classic. Rosewood handles are comfortable and handsome. They are springless—no worrying over a pesky broken spring—and the blades are easy to sharpen. A brass locking mechanism keeps them securely closed when not in use. 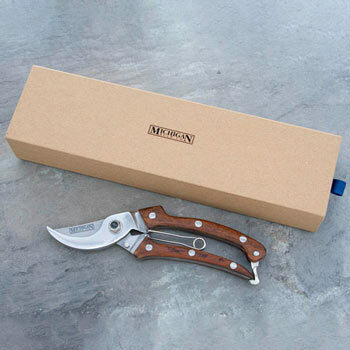 Our Rosewood Pruners make a thoughtful gift, too! 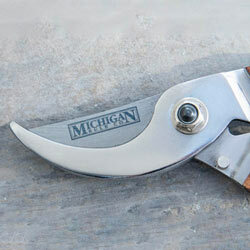 Replace your gardening friend's worn, flimsy garden center clippers with something built to last. They'll notice the difference quality makes in their day-to-day garden chores. The presentation is great, too—these come in a nice giftable box. Fertilizer and other supplies ordered apart from plant orders are typically shipped within 5 business days. If fertilizer is ordered with a plant order, we will send the fertilizer along with your plants per the timeline outlined here. Orders for physical gift certificates are typically shipped within 5 business days. Orders for e-gift certificates will send to the provided email address within an hour. Please Note: You will receive Order Confirmation and Shipping Confirmation emails when your e-gift certificate order is received. However, the confirmation messages may suggest that your gift will be shipped to your billing address. Not to worry—we will only send your e-gift certificate to the email address provided.